In front of a packed crowd at Scottsdale Stadium, the Arizona Diamondbacks and San Francisco Giants took to the field for the first Spring Training game of 2011. While the D-backs were handed a 7-6 loss from the Giants, the full story of Friday’s ball game extends far beyond the box score. 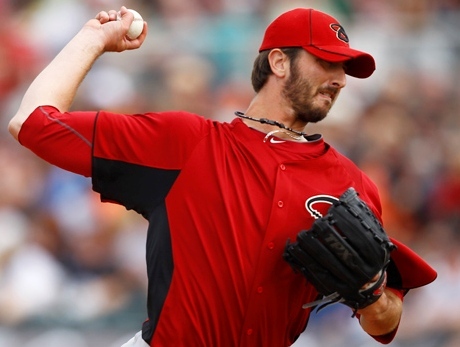 Spring Training is always a time for pitchers to compete and prove themselves on the mound. The D-backs have several new faces fighting for spots this spring, and three of them toed the rubber in the team’s opening game. Southpaw Wade Miley and newly acquired right-handed relievers David Hernandez and Kam Mickolio all saw action against the Giants. Miley — a young starting pitcher who isn’t in the mix for a bullpen spot but can use this Spring to make an impression on the coaching staff — took over on the mound for the D-backs in the bottom of the third. One of the team’s most highly regarded prospects lived up to his hype in his first inning of work. After walking the leadoff batter, Miley responded by inducing two groundouts and striking out Aaron Rowand to end an impressive inning. Miley returned for a second inning of work, but had to battle a little bit. The left-hander issued a pair of walks to Andres Torres and Mark DeRosa. Other than the walks, Miley looked as good as advertised on the mound. Miley also said that while he was not completely happy with the outcome, it was good to get the first game out of the way. Fans got a look at Hernandez in the bottom of the fifth. In his first outing in Sedona red, Hernandez looked sharp as he quickly got Pat Burrell to fly out to start the inning. Hernandez walked Pablo Sandoval before rebounding and getting Aaron Rowand to fly to left field and striking out Travis Ishikawa to end the inning. Following Hernandez, it was Mickolio who entered the game in the bottom of the sixth. Mickolio hit the first batter he faced, but quickly quelled any hopes of a Giants rally. The tall reliever then got Emmanuel Burris to hit a weak pop out to third base. Mickolio ended his first spring outing with two groundouts, and ultimately, the new D-back was happy with what he accomplished in his debut. Friday’s game was the first of the spring season for the D-backs, and like many of his teammates, Mickolio enjoyed taking the mound and competing against another team. It’s a gorgeous day in Scottsdale as the D-backs are set to take on the defending champion San Francisco Giants at Scottsdale Stadium at 1:00 pm today. I’ll try to bring some live blog details throughout the afternoon, including some quotes from Kirk Gibson’s pre-game press conference. This game is being broadcast on Sports 620 KTAR, so tune in on your radio in your car or office or wherever you may be this afternoon. 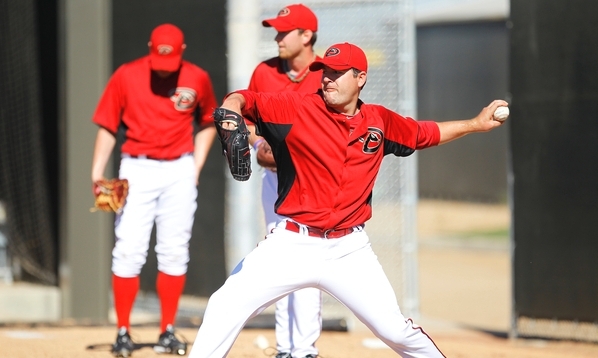 Also expected to pitch – Wade Miley, Kam Mickolio and David Hernandez. I’m actually excited to see all three of those pitchers. Miley has been impressive in bullpen sessions this spring and he was fantastic at Double-A last season, and Hernandez and Mickolio were the right-handed relievers acquired from Baltimore this offseason. “(Joe) Paterson, we shut him down for one day, but he threw a bullpen today and knock on wood, everybody is healthy. Chris Owings (oblique injury) took groundballs today. Tomorrow he’ll start throwing a little bit and do some light swinging. Mora can hit anywhere. He can hit first or second, he could hit eighth and he wouldn’t care. We were out for early work out, and we went out and guys were bunting, Zavada and Jaime were loosening up on Field one, and I went out to the batting cage and there’s Mora with (Minor Leaguers Mike) Freeman and (Matt) Davidson, putting balls on the tee for them. That’s just how he is. he’s a true pro, a guy who just likes to play. There is no ego there at all. Mora could hit anywhere. Just today and Sunday. The pitchers have hit a lot this spring. They’ve done a lot of bunting, a lot of slashing. They’ve hit a lot and for the first time through the games, it’s a time for Joe (Saunders) to focus on pitching. I wanted to get some of the guys hitting, like Wily Mo. We’ll do it against Sunday and that will be it. — Great first inning for the D-backs, with Willie Bloomquist, Melvin Mora, Justin Upton and Miguel Montero all hitting singles to get up 2-0, and Brandon Allen coming through with a sacrifice fly to right to give them a 3-0 lead. Joe Saunders followed up with a good, efficient 1-2-3 first inning concluding with a strikeout of Miguel Tejada. All in all, it’s exactly what you want to see from the D-backs this spring – quality at bats and good, efficient pitching. — There’s a hit-and-run for the D-backs here in the second inning, with Gillespie running to second and Bloomquist at the plate, and a grounder to third moves Gillespie up. I would imagine we’ll see a good amount of that stuff this spring, it’s exactly the reason they signed high-contact guys like Bloomquist and Mora. — The updates aren’t as fast and furious as I’d hoped — wireless internet has been a little sketchy at Scottsdale Stadium, I think the fact that there are far more writers than seats has caused some strain on the system. Wade Miley looked very good in his first inning of relief, with a hitless inning, one walk, one strikeout. He’s back for a second inning now. Xavier Nady went deep with an opposite field home run. If you’re familiar with the set up of Scottsdale Stadium, the ball went out right about where the outfield berm meets the Giants bullpen in right-center field. Nady is an important guy to watch this spring. — David Hernandez is in to pitch for the D-backs, with the Giants leading 7-4. He is among the pitchers I’m most interested in seeing this spring. There is a good chance he can be a back-of-the-bullpen guy for the team this year. We now J.J. Putz is settled in as the team’s closer, but the 7 and 8 inning roles are really up for grabs. Hernandez, Gutierrez and Heilman are the guys who have some experience in those roles, and they’re the guys most likely to claim them this year. Hernandez has good stuff, and his numbers in relief for Baltimore – a 3.16 ERA with a .236 opponents batting average in 37 innings – were pretty good and 15 of his 33 appearances were against the big bats of Boston, New York, Tampa Bay and Toronto. — It’s all over here, D-backs fall to the Giants 7-6. We’ll be out at Salt River Fields tomorrow for the opening of the new ballpark against the Colorado Rockies in front of a sell-out crowd. Should be exciting!